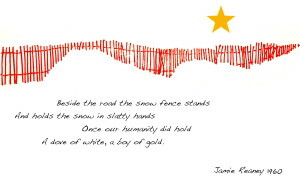 The snow fence drawing and the poem appeared on the December 1960 Christmas card designed by James Reaney. And holds the snow in slatty hands. A dove of white, a boy of gold. 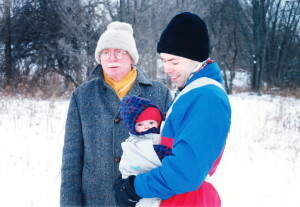 James Reaney and Ian Chunn (son-in-law) with granddaughter Edie Reaney Chunn, December 25, 1996 in London, Ontario. 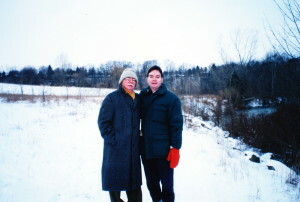 James Reaney on a winter walk with his son James Stewart Reaney, December 25, 1996.